Sound is vibration at a certain frequency. It is a universal force that can bring about profound changes at various levels; physical, emotional and spiritual. Sound is a powerful energetic medium that penetrates deeply in our mind and body and reaches the deeper layers of our consciousness. 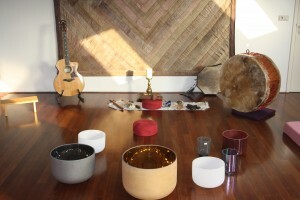 During a sound healing concert I play a variety of instruments thus creating an energetic field which feels soothing and relaxing to body and soul and can be used as a vehicle for focusing your intention on your highest goals.